Hunger is a devastating problem in third-world countries, but according to Bread for the World president David Beckmann, one-quarter of all African Americans live in poverty right here in the U.S. That's why he believes vanquishing poverty should be at the top of our "Christian" political agendas, and why he's urging people to vote on Tuesday. 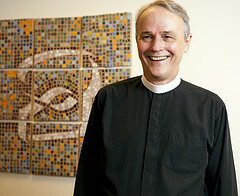 David Beckmann is the recent winner of the 2010 World Food Prize. In addition to being an anti-hunger activist, he is a Lutheran minister and an economist who formerly worked at the World Bank. His latest book is Exodus from Hunger: We Are Called to Change the Politics of Hunger. Christine A. Scheller interviewed Rev. Beckmann about his work, hunger in the African American community, and why we should be aware of the federal policies that influence issues of poverty in America. Christine A. Scheller: Congratulations on the World Food Prize. What are your thoughts about the selection? David Beckmann: I think it recognizes what Bread for the World's network of people and churches have done to reduce hunger in our country and around the world. CS: I saw that you're the first clergy member who was chosen. Did you serve in parish ministry before you went to work for the World Bank? DB: I served briefly as a parish pastor but my call when I was ordained was to be a missionary economist, to connect Christian faith and moral teaching to economics, especially poverty. CS: I'm always interested in what motivates people. How did you get interested in hunger and poverty issues? DB: I grew up in a Christian home and my parents cared about people in need. My dad was really concerned about making democracy work. But then I was a student in the late 1960s and that was a time when African American neighborhoods across the country were angry and when our government was supporting a lot of developing country governments that didn't seem to be doing right for their people. Being a young man at that time made me start asking questions about how we can get our country to do what it should do to address justice issues, poverty issues especially, in our country and around the world. So that really was a turning point. Since I was a boy, I thought I might be a Christian minister. As I got into the policy and politics of poverty, it seemed to me that underlying the lack of political will to do something about poverty was a lack of spiritual commitment. So for me it has always made sense that it's God, politics, hunger and poverty. CS: I tend to think that living in the United States, hunger is more invisible. How has it changed you working for the World Bank and Bread for the World? DB: What's most striking is that the world as a whole has made remarkable progress against hunger, poverty and disease. I believe in God, and I see that hundreds of millions of people have escaped from poverty in places like Ethiopia, Bangladesh, Brazil and Britain. That's why, for me, it makes sense that this is God moving in our history. And then I come back to the U.S.A. where we haven't made any progress against hunger and poverty since about 1973 and it informs, I think, the U.S. situation. If Brazil and Bangladesh can reduce poverty, it's clear that we could do it in the U.S. We just haven't tried for a while. But we did try as a nation. In the '60s and the early '70s, we had economic growth and we had a concerted effort under both Johnson and Nixon to reduce hunger and poverty, and we cut poverty in half. So it's doable here, too. ... I think the fact that we work on world poverty and domestic poverty together makes it all much clearer that our problem in this country is lack of commitment. CS: I saw on Bread for the World's website that one-quarter of African Americans live in poverty. Does that sound right to you? DB: That's right, and its worse for kids. Thirty-six percent of [African American] kids live in poverty. CS: Do African Americans have the highest rates of poverty and hunger in the U.S.? DB: Yes, they're similar to Latino numbers but for kids it's even worse for African Americans. For Latino kids its 33 percent. CS: What do you attribute these high figures to? DB: I think it's very feasible to reduce hunger and poverty in this country, but it requires political change and that political change won't happen without the leadership of African American people. Of course, we're already getting a lot of leadership from African American people, but it's got to be stronger. Well, for example, the election of November 2nd is really important. This is important for all of us, but it's especially important to hungry and poor people. CS: So African Americans need to vote. DB: People need to vote. They need to get their family members to vote. They need to get people in the neighborhood to vote. After the election, they need to stay involved. In December, Congress is going to finalize the Child Nutrition bill, and they're going to decide on tax credits for the working poor. In all the debate about taxes, all the focus is on the top 2 percent [of income earners] but the current provisions for the Earned Income Tax Credit and the Child Tax Credit also expire at the end of the year. If we don't maintain those tax rules, it will push a million more kids into poverty next year. Both those decisions are being made in December, but they're not even in the newspaper. So I think virtually everybody in the African American community knows what the Earned Income Tax Credit is, and I think through organizations like Bread for the World, African American people can become active in ongoing advocacy on poverty and hunger issues. But I think that the extent of ongoing advocacy on these issues is really pretty weak. CS: In the African American community? DB: Yes. A typical pattern is that members of Congress that are sympathetic come to visit, and the pastor [in an African American Church] may be active, but it's the people who need to be mobilized to push their senators and representatives on an ongoing basis on these issues. That's weak in the whole population. CS: Do you think that part of that has to do with the fact so many African Americans are living in poverty and dealing with the stresses of just trying to put food on the table? DB: Sure, people are busy with their own lives, but it's also that middle class African Americans could do a lot more because maybe middle class African American people have a sister-in-law or somebody who's in poverty. They know what it's about. Also, I think they could speak from their own experience or their relatives' experience and they speak with a passion. It's not just the right thing to do, it's also self interest and that changes the conversation. Of course African Americans are doing a lot already, but I think we have an opportunity right now to change politics in a way that will result in substantial help for people in need during the economic crisis. And then as the economy recovers, we can see dramatic progress against hunger and poverty. If there is really an opportunity now, it's probably because Obama is in the White House, and he's made important commitments to hungry and poor people. But he just can't get it done unless Congress, both Republicans and Democrats, help to support and shape his proposals and get them into law. This is the time. It's not just because of Obama. In fact, in general voter attitudes are more sympathetic to poor people in this country then they were 10 or 15 years ago. CS: Do you think that's because so many people are struggling? DB: I think Welfare Reform did more harm than good, but one piece of good it did was it changed the attitudes of Americans. If we look at voter surveys even before the recession, the idea that people are poor because they're lazy was much stronger in the early '90s than it was even before the recession. Now with the recession, everybody knows somebody who is poor through no fault of their own. So voter attitudes are more favorable than they've been since the '60s. CS: Bread for the World's website cites stats that say the federal government spends roughly $760 billion a year through programs and the tax code and 12 percent of that goes to programs directed at low-income individuals. That's a pretty good percentage of the budget. Many of us want to help people in poverty but are concerned about being able to sustain these programs. How do we balance these concerns? DB: My own view is that the most important thing in terms of reducing the government deficit is economic growth, so I think it is premature to cut spending. Right now we need to have credible plans to balance the budget over the next few years, but when unemployment is 10 percent, there's a lot of factory capacity that's not being used. This is not the time to cut spending. When we do have to make cuts, and we will, then the big-ticket items are taxes. Our total tax rates, in fact, are lower than they've been since the 1950s. That's really striking to me. ... And then, three items take up one-fifth of our spending each. The military is one-fifth, Social Security is one-fifth and health care is one-fifth. All the spending programs that benefit people in need -- all kinds, not just poor and hungry people, but disabled people, unemployed people -- all that's 18 percent. So I just think from an ethical point of view, when we've got to cut, we've got to go for the big things and that is higher taxes. I think we can trim the military budget without affecting our security. We've got to trim Social Security spending for upper and middle class people. In my judgment, those programs for people in need should be preserved. We should work hard to just make them as effective as they can be, but that is not the place to cut. CS: Do you think it's a harder sell right now to get middle class support for things like continuing the Earned Income Tax Credit? DB: People are concerned about the deficit. Almost everybody's taken some hit. So people are also concerned about themselves and their families. CS: But you're saying it's counterproductive to our ultimate good not only for the people who are in poverty but for those who are not? DB: Right. We can't have a robust recovery if a large fraction of our population is in financial crisis. I don't know if you know people who get [tax credits] but they reward work, so if you're just sitting you don't get it. You have to go out and get a minimum wage job, or you work at Applebee's and you get a part time job. As you know, they won't employ you full time. For low wage workers, many of the jobs available are part time and irregular. It's hard to hold three jobs if you have a job at Applebee's because your schedule changes every two weeks. How do you hold a second job? For people who are on the edges of the job market, the Earned Income Tax Credit and the Child Tax Credit bump up their wages a little bit so they can support their kids. CS: You said that ceasing these programs would push a million more people into poverty. Can you unpack that briefly? DB: During the stimulus package, they made some enhancements in the tax credits, so that's what expires, not the entire tax credit. But the other issue that's also [being voted on] in December is the Child Nutrition Act. One in four American children lives in a household now that runs out of food and one in three African American kids lives in a household that runs out of food. If we're trying to manage this economic crisis, we want to manage it in a way that doesn't allow two year olds to go without adequate nutrition because if those two year old kids don't eat properly, that does permanent damage to those kids. They will never be as productive and creative as God meant them to be. So we should pass a strong [Child Nutrition Act]. It would improve school lunches and strengthen the programs that reach low income kids with food. And then the other issue is the Senate saying, "Okay, let's do a little of those things, but let's take the money from Food Stamps." Seventy percent of the households that get Food Stamps have kids. So we ought to have a strong Child Nutrition Act that does not cut Food Stamps. It's the right thing; it's the economic thing. ... It was Milton Friedman's idea. Ronald Reagan loved the Earned Income Tax Credit because the incentives go towards work. But there are people, especially young workers, who are way on the fringes of the job market and so they're working, but their kids will not eat if we let it just be dependent on what they can bring home from the wage checks. CS: You've written a number of books, so what is your goal with Exodus from Hunger? DB: The basic message of the book is the same message we are talking about. I'm struck by the progress that the world has made against poverty and hunger. I think that can encourage people. It's written especially to people who are spiritually grounded in some way. I do think that when people realize that hundreds of millions of people have escaped from extreme poverty, if we think of that in religious terms, this is a great liberation; this is the Exodus of our time. It encourages us to think about our own country and think, "Well, let's get with the program!" This is something God wants us to do. The second message of the book is that God is calling us to change the politics of hunger because the need is especially great right now. But the opportunities are also very clear. We can do a lot, but we can't food bank our way to the end of hunger. CS: That is a great quote. DB: It's true. All of the food that we provide through food charities amounts to about 6 percent of the food that poor people get from the federal food programs: food stamps and school lunches and so forth. What we do through charity is really important, but the churches and charities cannot fix this problem. We've got to get the government to provide leadership and we have clear opportunities right now. People are kind of wailing about the dysfunction of our politics, but in fact Congress and the president have done a lot for poor people over the last couple years. ... I just think God has put it on a plate in front of us. We can make changes. We live in a very powerful country that has worldwide impact. It really is a democracy, so it puts a call to the faithful to get off the couch, right now! I hope we don't have one in three African American kids hungry 10 years from now. There is no reason for that. Forget everything else. We know how to feed kids. We can feed kids without distorting incentives and stuff. We allow one in three African American kids to go hungry. It's a decision that this society has made. It's clear that there's an important leadership role to play in changing the politics of hunger. I think God is telling all of us to get with the program, but we really need the energetic leadership of African American people of faith. *This interview is reprinted with permission from UrbanFaith.com.